There are no information at the moment. In March 2014, in the "Home of Mt. Fuji 'Tea Capital, Shizuoka Concept'", Shizuoka Prefecture set forth the edict to promote "Tea Capital, Shizuoka" in order to utilize tea-related resources in the prefecture with the aim of establishing the Shizuoka tea brand and realize a healthy and wealthy standard of living with tea. Based on this concept, the prefecture has decided to develop the former Shimada City Ochanosato Museum as the enter of "Tea Capital, Shizuoka". It is located on the Makinohara Plateau, the largest tea farming region in Japan, and consists of a museum, tea ceremony house, garden, and commercial facilities. In preparation for the opening of this facility as "Tea Museum, Shizuoka" in spring 2018, fukiyose style walls using materials made in the prefecture were built on the exterior, and many interesting sights to see were developed for visitors to tour inside the museum. 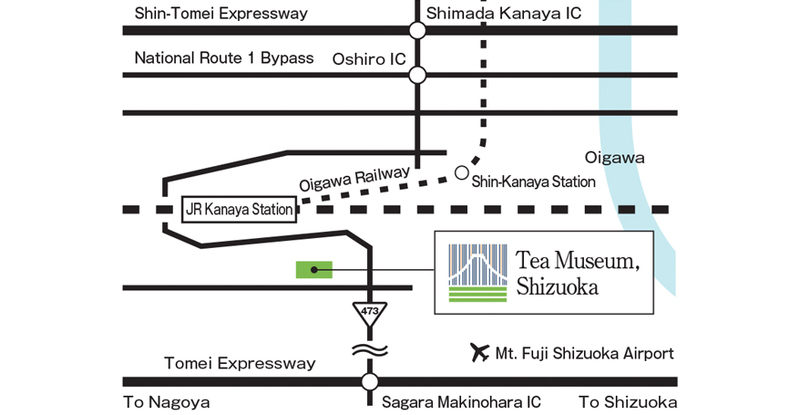 "Tea Museum, Shizuoka" features exhibits introducing tea industry, history, and culture, as well as rich tea picking and rubbing experiences as well as courses that teach using the five senses, and offers opportunities for everyone both young and old to enjoy learning about tea. In addition, the museum holds training sessions and collects and distributes information for people in the tea industry and tea lovers both in Japan and abroad. Tea is beloved the world round as a drink that soothes people's minds and expresses the spirit of hospitality. How many people have encountered tea and incorporated it into their everyday life so they can enjoy it? Let's start first by looking in to the history of tea. Then we will look at the unique form of tea culture developed as part of lifestyles in countries around the world. Japanese tea, which was imported from China, has developed unique cultural practices over the course of its 1,200 year history. The tea ceremony culture is one of these. Inside the museum, you can find a recreation of the world of the tea ceremony, which has had a great impact on Japanese arts, crafts, architecture, and landscaping. Just as Eisai Zenji wrote in the "Kissa Yojo-ki" (Treatise on Drinking Tea for Health) 800 years ago, tea has wonderful benefits for maintaining health, and these have now been scientifically proven. This museum was created as a base to inform people of the benefits of tea. Since Shoichi Kokushi introduced tea in the Kamakura Period (1185 - 1333 CE), Shizuoka has followed a long-standing tradition as a tea producing region. In particular, as a result of the cultivation of the Makinohara Tea Fields after the Meiji Restoration, Shizuoka has become a tea industry region supporting modern Japan, with the largest production volume and shipping volume in all of Japan. This museum was created based on the advanced technology and traditions of Shizuoka tea inherited from our ancestors. Please take the time to fully enjoy Tea Museum, Shizuoka, standing amidst the vast ocean of tea fields and gazing up at sacred peak Mount Fuji across the Oi River. Mt. Fuji and the tea fields are expressed with lines, and kirei-sabi is expressed with a fukiyose* pattern. Blue, yellow, and green are used to represent "Creating tea with water and light", a refreshing image representative of Shizuoka. *Fukiyose is a latticework design in which groups of 2 or more strips are clustered together with wide spacing in between groups. With the goal of incorporating the sensibilities of young people from the next generation and appealing to as many people as possible, students who study design were recruited from high schools, universities, and vocational schools in Shizuoka Prefecture. From the works submitted, a design conceived by Kunimitsu Fujii, a 1st year student at the Shizuoka University of Art and Culture at the time of submission, was chosen for use. In order to further enhance the quality of the "Tea Capital" and spread the appeal of tea both in Japan and abroad, the "Tea Capital, Shizuoka Concept" declared promotion directions for 8 fields: culture, lifestyle, academia, industry, sightseeing, personnel training, information communication, and base development. Following the 8 directions declared in the concept, a plan was compiled for how to specifically promote "Tea Capital, Shizuoka". 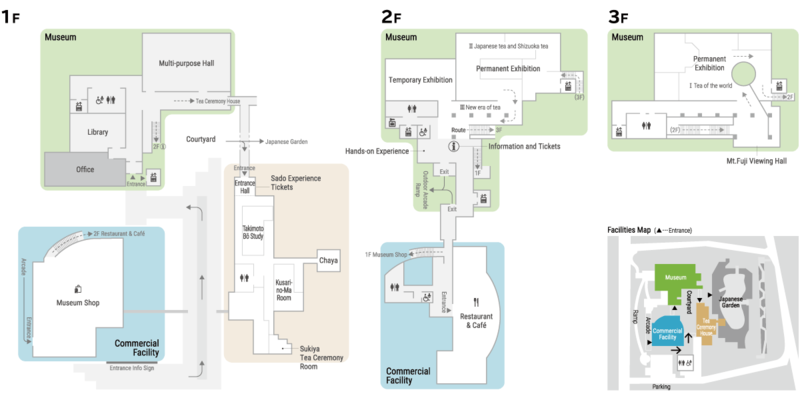 This promotion plan determined that the Shimada City Ochanosato Museum would be redeveloped as the base for Tea Capital, Shizuoka. Shizuoka Prefecture formulated an implementation plan and operation plan for the renovation of the Shimada City Ochanosato Museum. Shimada City Ochanosato Museum was closed and transferred to Shizuoka Prefecture. February 2017: Renovation design completed. April 2017: Tea Museum, Shizuoka construction started. April 2017: Isao Kumakura appointed as first director. May 2017: Renovation construction started. December 2017: Ordinances proclaimed regarding the installation, management, and materials used for Tea Museum, Shizuoka. *1　Group admission prices apply to groups of 20 or more people. *2　Visitors who have a physical disability certificate, rehabilitation certificate, or mental disability certificate, as well as one attendant per certificate holder, may enter the museum free of charge. ・Students at university level or below and seniors age 70 or older who are eligible for discounts must present proof of their age at reception. ・Separate charges apply to participate in interactive experiences. Serves Shizuoka tea and cuisine made using ingredients grown in the prefecture. Sells tea and tea related products in collaboration with exhibitions in the museum. Also has an area to sample, purchase, and learn about teas grown in Shizuoka Prefecture. The tea ceremony house "Shoumokurou" and adjacent Japanese garden are recreations of buildings and gardens designed by the tea master Kobori Enshu, famous for establishing the kirei-sabi style tea ceremony, following the legacy of tea masters Sen no Rikyu and Furuta Oribe.